The Newton Heath depot in Manchester has been servicing rolling stock since 1876. This busy urban facility is currently under the care of Northern Rail, England’s largest train operator, who is working it harder than ever, as electric vehicles are maintained, alongside traditional diesel engines. Having successfully installed an engine removal table at Northern Rail’s depot in Leeds, we were asked to take a trip across the Pennines to build a similar system that would work with two roads at the Manchester workshop. 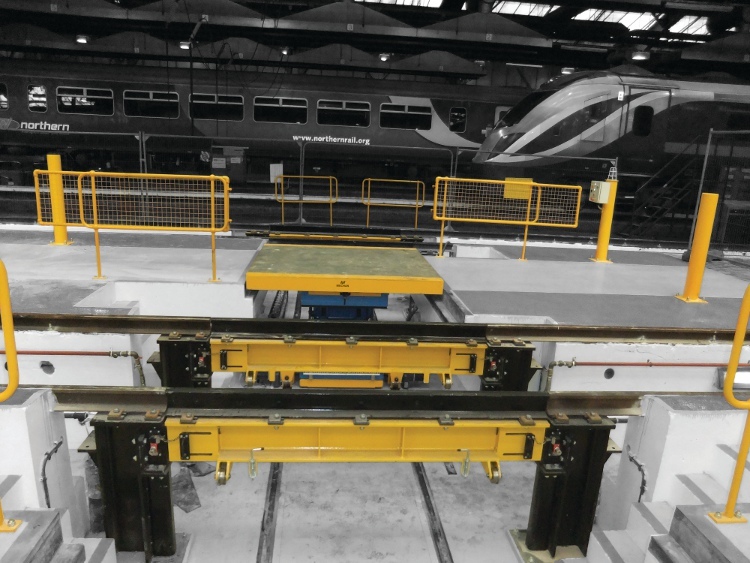 Our engine removal tables are sited below ground level to enable modules from the underside of a train to be exchanged without lifting it off the rails. In any existing depot, not least one conceived by Victorian engineers, finding space to accommodate a new maintenance pit is a huge challenge. This was achieved thanks to our space saving design, which allows the two affected roads to be used for other activities when the table is not in operation. We built a bespoke engine removal table to serve roads six and seven at Newton Heath. A shallow pit allows a trolley to be positioned under the train and used to traverse the separated parts to an area where they can be collected by forklift truck. A jib crane was also installed over road seven to move particularly heavy equipment away for servicing. Our partnership with Northern Rail has been so successful that we have since been asked to provide variations on our engine removal tables for the Allerton depot in Liverpool and Hull’s Botanical Gardens facility.